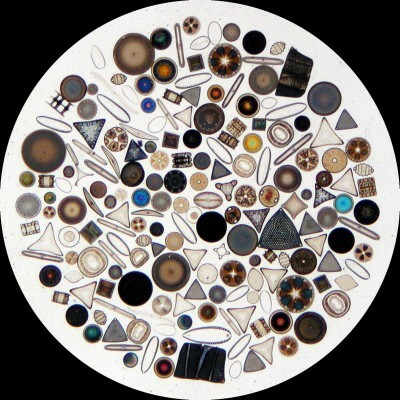 Individual members of the plankton are known as plankters. They are classified in at least three different ways: taxonomically, by size, and by their role in food chains. Viruses are clumps of RNA encased in a protein. Generally not considered living organisms, they nonetheless contribute dissolved organic matter (DOM), also known as dissolved organic carbon (DOC), to the microbial loop, a significant part of marine food chains. Bacterioplankters are decomposers and mark the beginning of very important detritus food chains. They are themselves consumed by zooplankters. Phytoplankters are either cyanobacteria or one-celled plants (algae) with chlorophyll or other light-sensitive pigments. They are the chief producers of the sea and mark the beginning of grazing food chains. The cell contents that leak from them add to the DOM, itself the food of many marine organisms. Autotrophic flagellates, with whip-like flagella that propel them up and down the water column, make up nearly 90 percent of the phytoplankton biomass and may account for more than half of primary production. Diatoms, encased in a rigid exoskeletons dominate the marine algae in nutrient rich waters Dinoflagellates are another important group. Some of these motile algae bioluminesce and produce phosphorescent surf. Others produce the toxins that make red tides lethal. Dinoflagellates are also the algae that live symbiotically with coral polyps and other organisms. In that role, they are called zooxanthellae.